St Paul was a Roman subject who was originally called Saul of Tarsus (Turkey). At the opposite drawing, St Kevin is shown holding a blackbird. This has something to do with a legend. Apparently every Lenten season, it was customary for St Kevin to practise a monastic existence, where he would flee from the company of men and seek solitude in a little hut, small enough to just keep him from the rays of the sun and drops from rain. He would then spend his time in earnest, reading and praying; and in between, in contemplation. As his customary position, he would kneel down and his hands outstretched through the window and lifted up heavenwards. A blackbird settled on his hand busying herself into making a nest and laying her eggs. The saint was so moved by what had occurred that he patiently and with all gentleness remained in the same position with his hand opened and not withdrawing even for a minute from the window until all the eggs had fully hatched into young ones. His hand remained unwearied and did its purpose in shaping new lives. ahhhhhhhh Such a beautiful story! 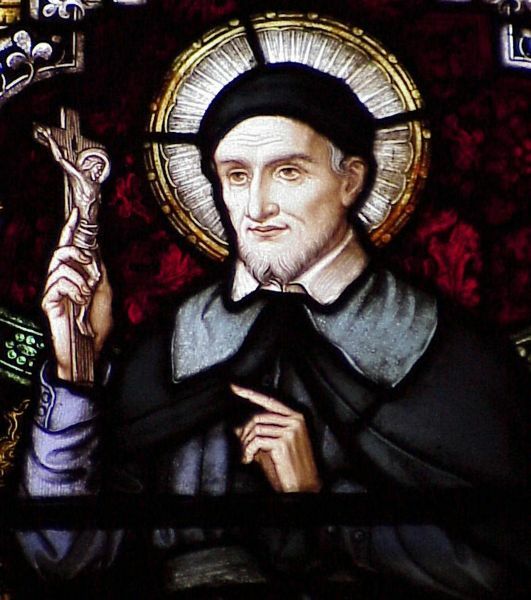 St. Vincent de Paul (24 April 1581 – 27 September 1660) was a priest of the Catholic Church who dedicated himself to serving the poor. He is venerated as a saint in the Catholic Church and the Anglican Communion. He was canonized in 1737. De Paul was renowned for his compassion, humility, and generosity and is known as the “Great Apostle of Charity”. A most powerful and efficacious remedy for all evils, a means of correcting all imperfections, of triumphing over temptation, and preserving our hearts in an undisturbed peace, is conformity with the will of God. A single act of resignation to the divine will in what it ordains contrary to our desires, is of more value than a hundred thousand successes conformable to our will and taste. Learning without humility has always been pernicious to the Church; and as pride precipitated the rebellious angels from heaven, it frequently causes the loss of learned men. Perfection consists in renouncing ourselves, in carrying our cross, and in following Jesus Christ. Now, he who renounces himself most perfectly carries his cross the best and follows nearest to Jesus Christ is he who never does his own will, but always that of God. To establish ourselves in a virtue it is necessary to form good and practical resolutions to perform certain and determined acts of that virtue, and we must, moreover, be faithful in executing them. When we receive with an entire and perfect resignation the afflictions which God sends us they become for us favors and benefits; because conformity to the will of God is a gain far superior to all temporal advantages. All that God gives us and all that He permits in this world have no other end than to sanctify us in Him. Charity requires us always to have compassion on human infirmity.—ST. CATHERINE OF SIENA. Consent to suffer a slight temporary pain, that so thou mayst avoid the eternal pains which sin deserves. Evil is often more hurtful to the doer than to the one against whom it is done. God is supreme strength, fortifying those who place their trust and confidence in Him.—ST. 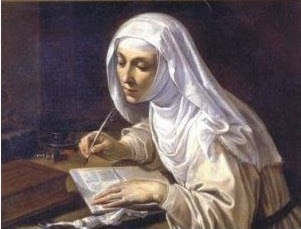 CATHERINE OF SIENA. It is the key of obedience that opens the door of paradise. Jesus Christ has confided that key to His vicar, the Pope, Christ on earth, whom all are obliged to obey even unto death. Is it not a great cruelty for us Christians, members of the body of the Holy Church, to attack one another? Let not confusion for thy fault overwhelm thee with despair, as if there were no longer a remedy. It is therefore true, indeed, that the soul unites herself with God by the affection of love. Love others much, but visit them seldom. Outside of God nothing is durable. We exchange life for death, health for sickness, honor for shame, riches for poverty. All things change and pass away. Prayer is a pasturage, a field, wherein all the virtues find their nourishment, growth, and strength. Raise thy heart and thy love toward the sweet and most holy cross, which soothes every pain! — ST. CATHERINE OF SIENA. To acquire purity of the soul, it is necessary to guard against passing judgment on our neighbor, or useless remarks on his conduct. 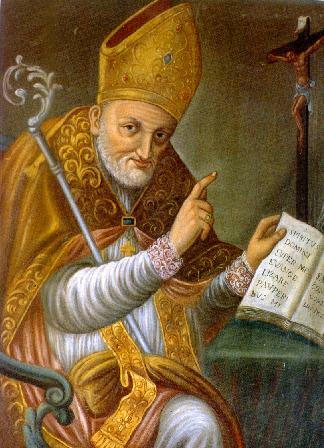 Alphonsus Maria de’ Liguori was from a Neopolitan nobility. He had a promising law career before he entered the priesthood. (27 September 1696 – 1 August 1787), was an Italian Catholic bishop, spiritual writer, scholastic philosopher andtheologian. All perfection consists in the love of God; and the perfection of divine love consists in the union of our will with that of God. It is folly not to think of death. It is greater folly to think of it, and not prepare for it. The upright intention is the soul of our actions. It gives them life and makes them good.